The vendor landscape of the global submarine sensors market is intensely competitive and features the presence of several prominent vendors. So as to sustain in the highly competitive market, companies are focused on the development of advanced, high-quality, and economical products. 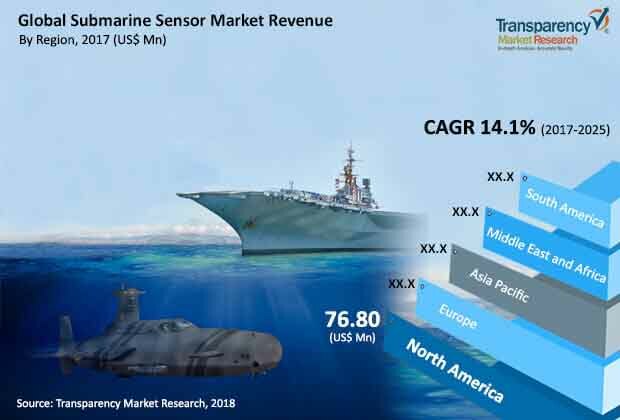 Investments aimed at geographical expansion, improving R&D and distribution networks across lucrative regional markets, and strategic partnerships with leading submarine manufacturers are also some of the key growth strategies adopted by vendors operating in the global submarine sensors market. Some of the leading companies operating in the global submarine sensors market are Atlas Elektronik, Safran Electronics & Defense, Harris, DRS Technologies, Lockheed Martin, L­3 KEO, Northrop Grumman, Ducommun, and Raytheon. According to the report, the global submarine sensor market is expected to expand at a CAGR of 3.6% over the period between 2017 and 2025, rising from a valuation of US$230.48 mn in 2016 to US$315.17 mn by 2025. Of the key varieties of sensor used in submarines, including sonar, acoustic, electromagnetic, and fiber optic, the segment of acoustic sensors contributed the dominant share in global revenue in 2016. The segment is also anticipated to expand at a promising growth rate during the report’s forecast period, thanks to their ability to detect threatening submarines operating below periscope depth. Geographically, the market for submarine sensors in North America held the dominant share in the global market in 2016 and is expected to expand at a prominent pace during the forecast period as well. North America and Europe together accounted for over 49% of the overall and remain the trendsetters by contributing through innovative products owing to the presence of prominent market players in these regions. Fueled primarily due to the rising deployment of attack submarines by naval agencies across the globe and the recent advancements in the acoustic sensor technology, the global submarine sensor market has expanded at a noteworthy pace in the past few years. With recent advancements in acoustic sensor technology, there has been a significant growth in acoustic sensors for submarine applications. Acoustic wave sensors are so named because their detection mechanism is a mechanical, or acoustic wave. Moreover, the increased usage of sonar and acoustic sensors in submarines so as to enhance their detection capabilities is also helping the market gain momentum, particularly in developing geographies such as Asia Pacific. However, factors such as the low availability of skilled laborers and high capital investments required to undertake research and development activities are anticipated to hinder the growth of submarine sensor market to a certain extent during the forecast period. Nevertheless, continued and sustained investments in advanced undersea warfare technologies, capabilities, and capacity are projected to spur the growth of submarine sensor market in the coming years.